Veterans of the U.S. Coast Guard (USCG) were often exposed to occupational hazards that could cause serious health issues. These health risks were similar to hazards encountered by U.S. Navy personnel, such as noise and vibration (guns, equipment and machinery), and exposure to asbestos, industrial solvents, paint, lead, radiation and PCBs. Hearing loss and tinnitus (ringing in the ear) are common occupational hazards for military personnel, including members of the U.S. Coast Guard. Ear injuries are usually the result of noise and vibration from equipment, machinery, engines, explosives and weapons. Asbestos is a highly toxic mineral that absorbs sound and resists heat, fire, electricity and chemical reactions. It was mined worldwide and used for centuries in construction, manufacturing and shipbuilding. Inhalation of asbestos fibers can cause serious and fatal illnesses like lung cancer, mesothelioma and asbestosis. Illnesses related to asbestos exposure can take many years to develop. When symptoms do appear, it is usually during the later stage of the illness. Types of mesothelioma symptoms include chest pain, fluid buildup, painful breathing, persistent cough, stomach pains, weight loss, loss of appetite and heart murmurs. 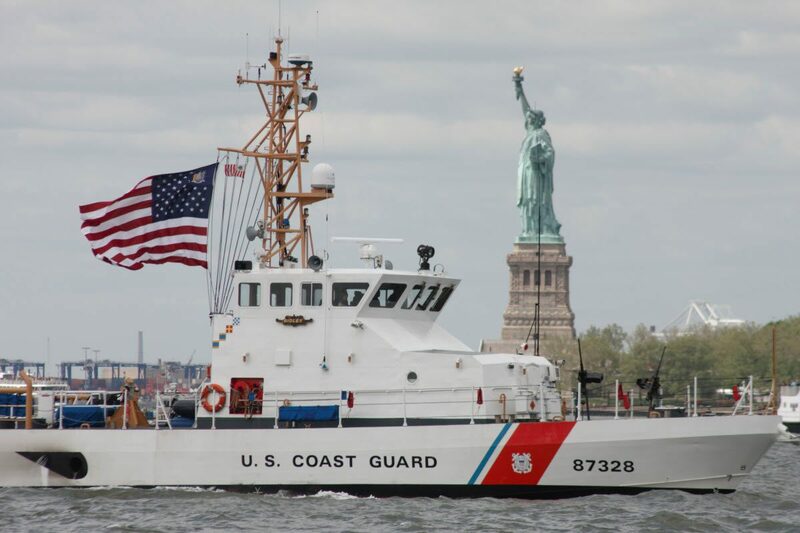 Asbestos was used on many Coast Guard vessels (especially cutters) for fireproofing, insulation of wires, plumbing, pipes and boilers, and to strengthen other materials like ropes. Coast Guard personnel who served during World War II have a higher risk of contracting mesothelioma from asbestos exposure than any other wartime period. Coast Guardsmen who helped build, repair or maintain ships are also at risk, especially service members who worked at the Coast Guard Yard in Curtis Bay, Maryland. The Curtis Bay Yard was established in 1899 and is the Coast Guard’s only shipbuilding and repair site. Asbestos was used throughout the facility before strict regulations were implemented in the 1980s. Various toxins have also been found in the facility’s ground water and soil, such as pesticides, metals, PCBs and dioxin. LORAN (long range navigation) was a radio navigation system developed during World War II. Dozens of LORAN stations were built throughout the world, sometimes in extremely remote locations. In 1958, the U.S. Coast Guard took over LORAN operations from the Navy, including management of LORAN stations. Early LORAN systems were built with cathode ray transmitter tubes, which emitted radiation. It wasn’t until 1994 that the tubes were shielded. Most of the tubes were eventually replaced with non-radiation technology. An estimated 10,000 Coast Guardsmen who worked at LORAN stations from 1942 to 2010 may have been exposed to radiation from these tubes. Potential health risks from the exposure include skin cancer and cataracts. U.S. Coast Guard vessels provided support to the Navy during the Vietnam War. Coast Guardsmen who served on these ships may have been exposed to Agent Orange and similar types of toxic herbicides. Agent Orange was a tactical herbicide used for defoliation. The VA has determined that all military personnel who served in Vietnam between January 9, 1962 and May 7, 1975, and later became ill with certain diseases, may have been exposed to Agent Orange. The same is true for members of the military who served in or near the Korean demilitarized zone between April 1, 1968 and August 31, 1971. The Veterans Administration provides various benefits to Coast Guard veterans, including disability compensation, health care, pensions and burial, along with home loans, life insurance, vocational rehabilitation, education, training and career counseling. Disability compensation is a monetary benefit paid to veterans who were injured or became ill during active military service (or whose illness/disability became aggravated during active duty). Benefit amounts are based on a disability rating system from 0% to 100%. The VA also provides medical benefits to Coast Guard veterans who were on active duty and received an other than dishonorable discharge. Types of medical care include both hospital and outpatient care for general health, and specialty services such as cardiology, dermatology, diabetes, endocrinology, gynecology, infectious disease, neurology, orthopedics, podiatry, spinal cord injury, transplant surgery, vascular surgery. pharmacy, radiology, physical therapy, audiology and speech pathology, dental, prosthetics and vision care services. VA pensions are also available for Coast Guardsmen who served during wartime, including the VA Aid & Attendance long-term care benefit. Aid and Attendance is a VA long-term care pension for military veterans, their spouses and surviving spouses. The benefit is a reimbursement for home care, adult day care, board and care, assisted living, skilled nursing facility care and, in some situations, independent senior living communities. Aid and Attendance monthly pension rates range from a maximum of $1,153 for a surviving spouse, to $2,846 for two married veterans. The Coast Guard veteran served at least 90 days of active duty with at least 1 day during an eligible period of war. The Coast Guard veteran received an other than dishonorable discharge. The Coast Guard veteran is 65 years of age or older. The surviving spouse was married to the veteran at the time of his/her passing and did not remarry. The veteran/spouse needs help with some of the activities of daily living, such as bathing, dressing, eating, toileting and transferring (mobility). The veterans or spouse must also meet various criteria regarding income and assets. Aid and Attendance monetary benefits are tax-free and do not need to be paid back. If you would like to find out more about how the benefit works, contact one of our Aid & Attendance consultants today at 877-427-8065. Aid & Attendance benefit news and information; applying for the VA Aid & Attendance long-term care pension. American Veterans Aid (AVA) helps veterans, spouses and surviving spouses get the financial assistance they need to pay for long-term care. We specialize in VA Aid & Attendance claims. Aid & Attendance is a lifetime pension for qualified veterans and spouses who need personal care. The benefit helps cover the cost of home care, board and care, adult day care, assisted living and skilled nursing facility care. AVA was founded by a war-era veteran after discovering that very few people knew about this important benefit. and how difficult it was for veterans and their families to get VA benefit claims approved. Since our launch in 2010, we have expanded to over 25 highly skilled staff, including one of the top VA Accredited Claims Agents in the country. AVA has a stellar record of success helping more veterans and spouses apply for and receive the Aid & Attendance benefit than any other company in the U.S.
American Veterans Aid is a privately owned company and is not affiliated with the Department of Veterans Affairs or any government organization or agency. Copyright © 2019 American Veterans Aid. All rights reserved.